DEAR JERRY: I have the same question about three different records in my collection: "When I Was 15" by Mary Sneed (Capitol 5291); "I Still Care" by Miss Frankie Nolan (ABC-Paramount 10231); and "Ya Gotta Take a Chance" by the Bonnets (Unical 3010). I think each of these is by a more familiar artist who's using a pseudonym, and that Mary Sneed is actually Carole King, Miss Frankie Nolan is Frankie Valli, and the Bonnets are the Delrons. I would appreciate knowing your thoughts on this matter. DEAR KATSUHIRO: I don't believe any of these three are pseudonyms for who you think they are, though their real names may differ from what's on the record labels, and they may have even recorded under another name along the way. Still, there is a direct connection between two of these and the artists you suspect they really are. 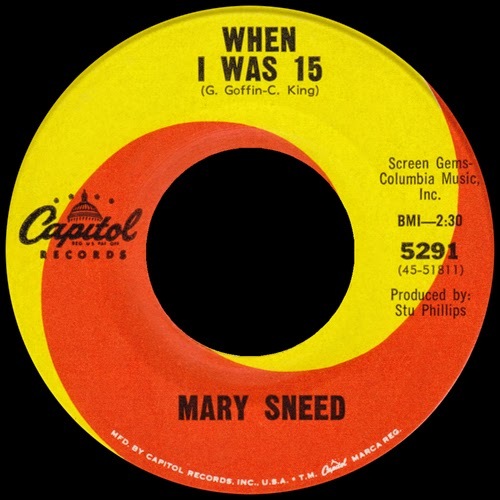 The Capitol single is by Mary Sneed; however, "When I Was 15" was written by Carole King and her then-husband, Gerry Goffin. Miss Frankie Nolan is indeed a female, but the backing vocals on her ABC-Paramount single are by Frankie Valli and the 4 Seasons. I know, they're both named Frankie, and Mr. Valli often sings in falsetto. I find no connection between the Bonnets and the Delrons, with or without Reparata. DEAR JERRY: I can't remember the title or artist of a soul tune from the 1960s, but am hopeful you will know it. This song is by a male singer who honors several of the top R&B performers of the '60s. He not only mentions each of them by name but attempts a brief impersonation of each man's vocal style. The tune I have in mind is NOT "Sweet Soul Music," by Arthur Conley, though they both involve a similar tribute gimmick. Also, Conley's tune is much faster. 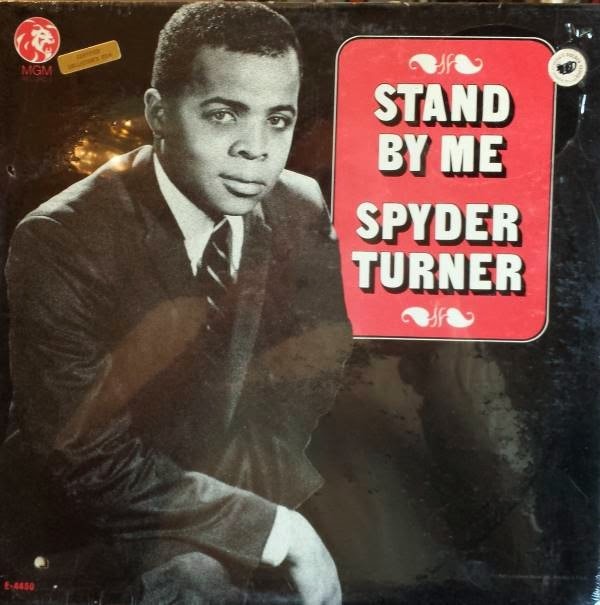 DEAR DUANE: Interestingly, Arthur Conley's "Sweet Soul Music" (Atco 6463) made its national chart debut March 11, 1967, exactly one week after a 12-week chart run of "Stand By Me" (MGM K13617), by Spyder Turner. I have no doubt that Spyderman's reincarnation of Ben E. King's soulful classic is the record you hope I know. For this single, MGM concocted an uncharacteristically substandard label. It simply reads "Vocal impressions of 'My Girl' (BMI), 'I'll Try Something New' (BMI), 'Any Day Now' (ASCAP)." The licensing affiliate (BMI or ASCAP) for each selection is also shown exactly this way, which is very unusual. A more informative and appropriate layout would be to indicate that Spyder's impressions are of the singers rather than their songs. Plus, by naming only the songs and not the honorees, neither Jackie Wilson nor Billy Stewart are mentioned anywhere on the label. Those two impressions are done using "Stand By Me" instead of sampling one of their hits. Vocal impressions of Jackie Wilson; David Ruffin of the Temptations ("My Girl"); Billy Stewart; Smokey Robinson of the Miracles ("I'll Try Something New"); and Chuck Jackson ("Any Day Now"). Everything stated so far applies only to the 45 rpm single, with a run time of 2:47. Two weeks after the single hit the charts, MGM issued an LP, also titled "Stand By Me" (SE-4450). The album has the full-length (5:35) version of the title track, making time for four additional soul singers (below in CAPS) to get a nod. In order heard, here is the extended roster of impressions, none of which are of the Impressions: Jackie Wilson; JAMES BROWN; EDDIE KENDRICKS (Temptations); MELVIN FRANKLIN (Temptations); David Ruffin (Temptations); Billy Stewart; SAM COOKE; Smokey Robinson (Miracles); Chuck Jackson; and finally Spyder Turner with a shout-out to himself. One huge difference between Turner's "Stand By Me" and Conley's "Sweet Soul Music" is that Arthur does no impressions. He simply spotlights five acts, and, except for James Brown, sings the title line from one of their hits: Lou Rawls "Love Is a Hurtin' Thing"; Sam & Dave "Hold On! I'm a Comin'"; Wilson Pickett "Mustang Sally"; Otis Redding "Fa-Fa-Fa-Fa-Fa (Sad Song)"; and James Brown (no song mentioned, just that "he's the king of 'em all, y'all"). James Brown is the only person mentioned in both "Stand By Me" and "Sweet Soul Music." IZ ZAT SO? The genesis of "Sweet Soul Music" is Sam Cooke's "Yeah Man," one of the tracks on his 1965 LP "Shake" (RCA Victor LSP-3373). Cooke's original tune focuses on some popular 1960s dances, especially the monkey, watusi, twist, and swim. No reference is made to any singers or song titles. Writing credit for "Yeah Man" shows only Sam Cooke, whereas "Sweet Soul Music," with many different lyrics but nearly identical music, is credited to Otis Redding and Arthur Conley. Somehow, Cooke's musical contribution just vanished. Because Sam wrote the music, the credit should read either "Cooke - Redding - Conley" or "Redding - Conley - Cooke."